My father’s war | Paul Hassing's autobiography. Not my dad. See Chris’ comment below. In 1939, my dad was a kid in The Netherlands, just a few clicks west of the German border. World War II had a profound effect on his life – and mine. Unlike many combatants, dad related his war stories often. Probably better out than in. At the start, dad chatted to Axis soldiers invading. At the end, his house hosted Allied soldiers liberating. One of them accidentally fired his rifle through an upstairs bed containing three of my young (lucky) uncles. In between, dad saw a Lancaster bomber flying low – ablaze from nose to tail. A Messerschmidt fighter out of fuel – gliding, gliding, gliding – only to crash in a local quarry. During an air raid, a German solider snatched dad to the safety of a slit trench. A shrapnel fragment sliced the head off a neighbour’s prize rooster. Ravenous from rationing, dad once approached a group of soldiers boiling something in a cauldron. On their invitation, he peered in … to see a cow’s head leering up at him. At war’s end, dad’s country was shattered; his prospects very poor. He wanted to escape to Canada, but Australia was offered instead. He arrived, built a new life, and helped give me mine. Our house was full of books about Hitler and the war. Dad seemed obsessed with the subject, and it rubbed off on me. I once asked why he read and watched so many things about such a dreadful time. He said he was still trying to understand how and why it all happened. Now I’ve read every book and watched every film and documentary too. And I don’t get it either. What a wonderful story and beautifully written. Capturing the words of those that experienced first hand the trials of war are brilliant. So much is lost in the retelling or the ‘Hollywood’ spin. My mother in law speaks of, as a child, watching dog fights in the skies above her home in Holland and the drone of bombers as they pushed deep into Germany. Things we can only imagine. I have over a hundred books on War, including Bean’s Official History of World War One. They provide an insight, a glimpse of the horror, but it’s impossible to know how they really felt. I often wonder how I would’ve measured up in the same circumstances. It’s hard to image that I would have come close to these early heroes that, through their actions, defined the tone and pride of our country. Lest we forget indeed. Thank you, Malcolm. Given your deep interest in this subject I prize your feedback. Yes, the DC-3 from Essendon doesn’t hold quite the same terror for our generation. I often think I’d fall to pieces from the first in a war situation. But, as you say, we can’t know until it happens. We can only hope we’d be up to the challenge. And the way the world’s going these days, we may yet be put to the test! Kind regards and thanks again. P.
Wonderful post, Paul. Especially on such a day. I don’t understand it (war) one bit. Human cruelty. And still it goes. Not on the same scale, but the same cruelty. You can count me out but, I guess, in war, you can’t always get counted out. You have to be in. I don’t like it. I got this email from Chris, who kindly gave me permission to reproduce it here. He writes so well, and the story is so interesting, that I couldn’t bear to let it fade in a folder. Many thanks Chris! On the subject of armour, I thought you’d be interested to know about my father’s wartime experience. My father lived in Eindhoven. In 1944 he was been press-ganged and taken to a German labour camp just inside the German border. On hearing of the liberation, he escaped from the camp and made his way back to Eindhoven, where he joined (in October 1944) the British Army. 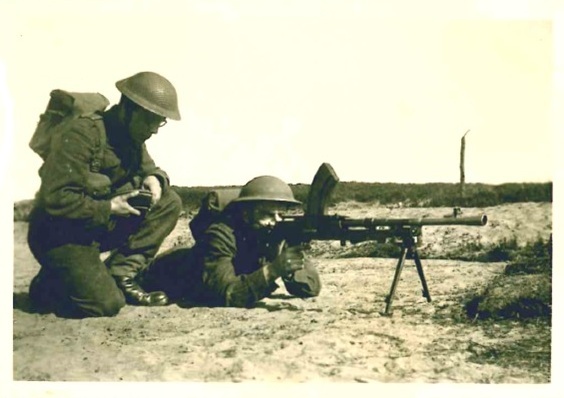 Following some ‘in the field’ training (I have a nice photo of him being instructed in firing a Bren gun*), he was assigned to the 3rd Reconnaissance Regiment of the British 3rd Division, principally in the role of interpreter. He spoke Dutch, English, German, decent French and, as all good Catholic boys did in that day, Latin. (Unfortunately the Italians has surrendered by that time so the latter proved of little value). Anyhooo, where I’m going with this is that as my father was an interpreter in a reconnaissance regiment, he typically served in the forward operating area in contact with the enemy. For this he was afforded the use of a Daimler armoured car. Apparently the regiment also had Humber armoured cars, but my father told me that the Daimler was his favourite. It was fast, manoeuvrable (including three reverse gears) and well armed – unlike the scout car version, his had the turret and the ‘2-pounder’ gun (40mm I believe) which packed a handy punch. Clearly not in the same league as a German 88mm, but fit for purpose. He also said that the Daimler’s Besa MG was a handy bit of gear. So, the Daimler armoured car remains by favourite armoured vehicle. Although I’m partial to the German Panther. * See top of post for said Bren gun pic.